Sian Ka’an in the Mexican Caribbean is the largest protected area in the region. It was designated as a Biosphere Reserve in 1986 and is home to a wide range of flora and fauna, both indigenous and migratory. In 1987 it became a UNESCO World Heritage site and it remains ecologically important and equally sensitive. However, at this moment in time much of coastal Quintana Roo, Sian Ka’an included, is facing two significant environmental and socio-economic challenges. The first of these is the invasion of Sargassum, a marine macroalgae that is coating the once golden beaches. This algae plays an important role in the marine ecosystem, transporting the larvae of a number of animal species over large distances. However, whilst a small amount of Sargassum is a common sight on the beaches and there have been anomalous amounts in the past, the current abundance is at a whole new level and it does not appear to be abating. For months on end, residents and holiday makers have had to deal with covered beaches, brown water and the putrid smell of rotting algae. The second challenge is from plastic pollution, much of which is getting caught up in the algae. Like nearly every coastline on the world, the tides and currents in Mexico bring a daily deposit of debris onto the shoreline. In more popular tourist areas there are at least some management processes in place; Sargassum is collected, along with the plastic and ‘disposed of’. Not all of the disposal processes are ideal and one particular location I visited simply buried the weed into the sand – walking on the beach was more like negotiating one of those fairground inflatable obstacle courses. However, more remote locations don’t have the benefit of beach cleaning facilities, even if they are ineffective. They simply accumulate more and more Sargassum and more and more plastic. I decided to visit Sian Ka’an, slightly out of season when the few hotels and campsites in the region would be closed, to take a look at the scale of the issue. The piles of Sargassum were high, the water is brown and there is that pervasive aroma of decaying vegetation where ever you go. 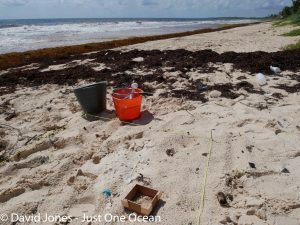 However, whilst the amount of Sargassum was significant, natural processes appeared to be at work, removing a proportion of the algae that it deposited with each successive wave and tide. The beach looked very different every morning to what it was the night before. However, the same was not true of the plastic pollution. 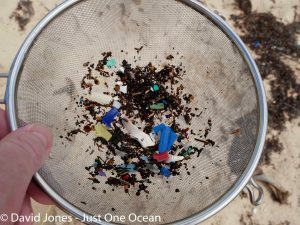 It was almost as if there was Sargassum delivery system at work, bringing in microplastics trapped within it and depositing it on the beach before leaving on the next wave. 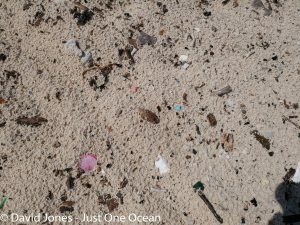 With no hotel staff to clean it up, the amount of plastic and in particular microplastics I found on the beach was inevitable, but still shocking with the highest incidence of microplastics I have found outside of the Philippines and Indonesia. Mexico is proud of its efforts towards environmental protection and is clearly a country that takes conservation seriously. The principal legislation for environmental protection in is the General Law of Ecological Balance and the Protection of the Environment (LGEEPA) which promotes sustainable development, the preservation, restoration and improvement of the environment and the protection of biodiversity under the Secretariat of Environment and Natural Resources (SEMARNAT). They currently have 40 biosphere reserves and only the USA, Russia and Spain have more. This means that Mexico’s portfolio exceeds the requirements of Aichi Target 11 and the IUCN goals set in 2016. However, the success of any conservation and environmental protection programme is not ordained simply by the act of drawing lines on a map, placing a policeman on a gate, or putting up a sign. To be effective protected areas need to be managed, monitored and enforced, but they also need to be maintained. 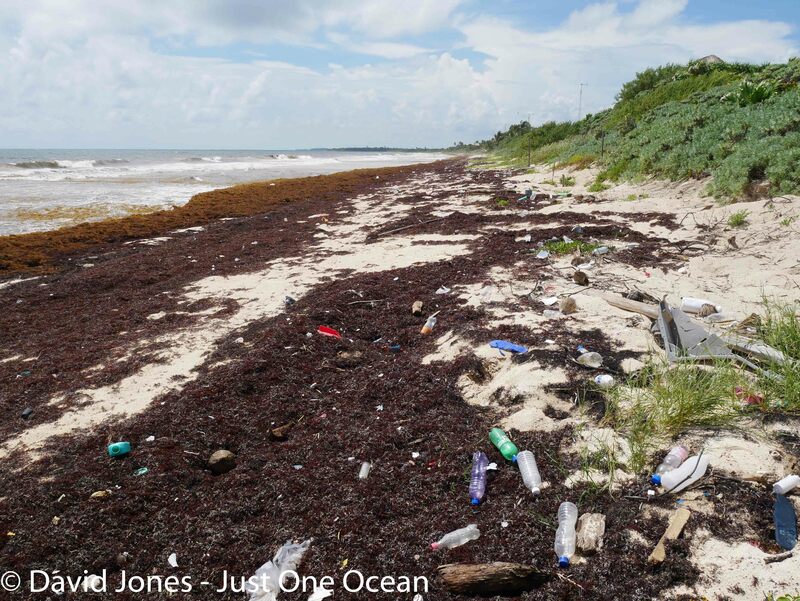 The two challenges facing the Sian Ka’an Biosphere Reserve are interlinked, but whilst Sargassum is making the news, everyone is turning a blind eye to the plastic pollution issue. This is unacceptable. 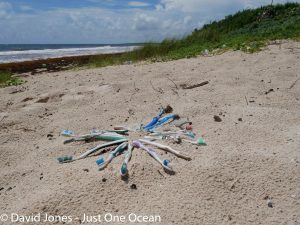 Something needs to be done about the plastics and microplastics in Sian Ka’an urgently. Environmental protection and conservation should not be left to hotel owners, although they clearly have a role to play, it is a national responsibility that should be driven by government and SEMARNAT. If you are willing to accept the plaudits associated with international recognition by UNESCO and the rest of the world you should also be willing to take responsibility. It is not simply going to go away. Previous PostCheck out the map!